Caption: Speaking to several hundred educators and union activists at the NYSUT Presidents Conference on Endorsements today in Colonie, 13-year-old student Sanara Ismail (pictured above) urged educators to help their students who are motivated to take action. These students are too young to vote. But they're already making a difference. Sanari Ismail is 13 years old. She is changing the world. This past spring, she convinced the administration at her Farnsworth Middle School in Guilderland to allow students to participate in the National School Walkout in the wake of the Parkland, Fla., school shooting tragedy that took 17 lives and injured 17 others. Speaking to several hundred educators and union activists at the NYSUT Presidents Conference on Endorsements today in Colonie, Ismail urged educators to help their students who are motivated to take action. “Give your students a voice,” she said. She was one of seven students who presented a panel discussion, “Too Young to Vote, Old Enough to Take Action.” They said educators do a lot to help develop young citizens, but many times, they could do more. “School should be a place where you can develop a political consciousness,” said Genesis Logan, 16, from Brooklyn, by infusing civics and citizenship into creative curriculum, particularly art, music and writing. Jordyn Bucci-Mooney, 18, a senior at Shaker High in Latham and a GLSEN activist, said in addition to inclusive curriculum, inclusive school policies, and safe places for students who are often harassed for their sexual orientation or gender expression, students need supportive teachers. “You don’t have to come into class on the first day and say, ‘I am a liberal teacher and I will support you.’ That’s not what we’re looking for. “To have open discussions in a classroom setting over controversial topics is very difficult, but needs to happen,” she said. Mallory Sunday, 17, from Massena High School near the Canadian border, has gotten involved with the regional “People Project,” backed by NYSUT and the Massena TA, led by President Erin Covell. The project started when area labor unions — including teachers and steel workers — came together to save valuable jobs for the community at the local aluminum plant. “I was so inspired to learn that the unions … had banded together” to help save the community from economic despair, Sunday said. Also on the panel were O’Shunn Gibson-Henry, of Rochester; Acadia Gilcrest, Jamesville-Dewitt; and Nupal Kiazolu, Brooklyn. Earlier in the day, participants heard an update on the 2018 legislative session[LINK to our wrap up from JULY NU] and a look ahead to 2019. State Comptroller Tom DiNapoli gave brief greetings and said the fiscal outlook going into next year is not great, with a projected deficit of $4 billion as we head into next year’s budget talks. 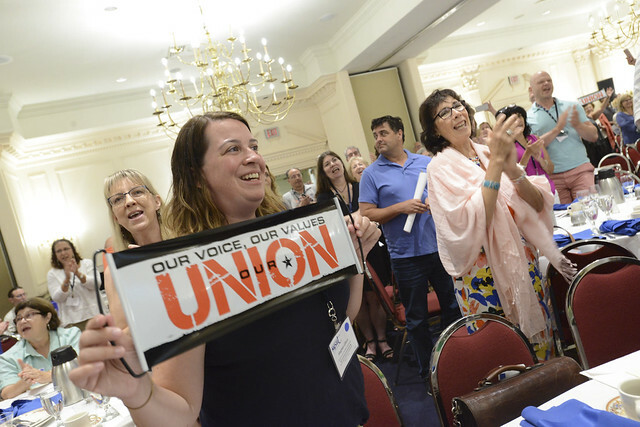 “We’re going to have our challenges,” said NYSUT Legislative Director Chris Black. Black said priorities for next year include fair and adequate funding for K-12, higher education and health care; final resolution of the unresolved APPR fix; expansion of the loan forgiveness program and other steps to address the teacher shortage; and further steps to strengthen the state’s Taylor Law in the wake of the Janus decision. Political Director Melinda Person said the billionaires who funded the Janus case did so for one reason: because we are so strong politically. She outlined our vision: good jobs; affordable health care; great public schools and access to higher ed; a vibrant democracy with a free press and unfettered rights to vote, and to stand against discrimination and bigotry in all their forms. Person outlined our mission: to be a check on the DeVos agenda and to take back one of the houses of Congress; to see Democratic Sen. Andrea Stewart-Cousins installed as majority leader of the state Senate; and to protect our friends and punish our enemies.